There are not many things I’ll claim to fangirl status for, but improvisational comic geniuses completely knock me out. In college I got hooked on the British import show “Whose Line Is it Anyway?” a short-form improv program that featured English and American players such as John Sessions, Paul Merton, Ryan Stiles, Colin Mochrie, Josie Lawrence, Greg Proops, Mike McShane and Brad Sherwood, among others. Incorporating suggestions from the audience, the comedians played theater games; explaining bizarre uses for odd props; making up songs; presenting scenes in a range of theatrical styles; and generally thinking and acting and rhyming faster than any other humans on the planet. It’s one thing to be able to improvise a scene with other actors. It’s another thing to walk onto a stage and create characters out of thin air that are wildly funny. Even among celebrities very few people are good at it — Robin Williams, Tina Fey, and Amy Poehler come to mind. And then there are the “Whose Line” guys, who are not just good at it, they are great. They’ve built entire careers around the concept of “yes and” — accept the premise and build on it —performing hilarious routines they conjure on the spot. 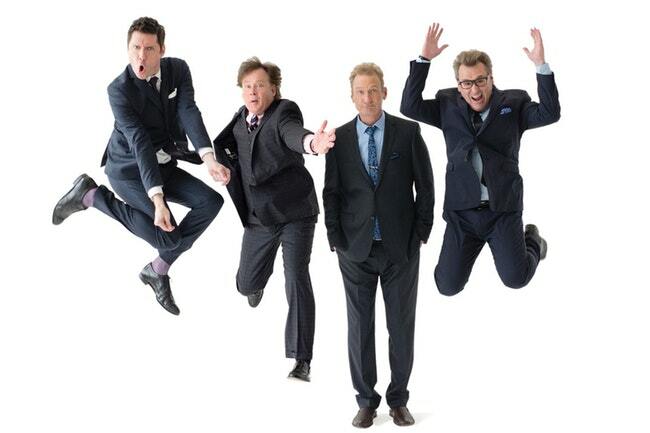 So I was one of the audience members yelling loudly when Greg Proops took the stage at Overture Center on October 4th for the “Who’s Live Anyway?” show, featuring the familiar faces Proops and Ryan Stiles, and new players Jeff B. Davis and Joel Murray. Dressed in suits and dapper dark ensembles, taking their places on chairs on an otherwise bare stage, you might mistake the mostly middle-aged group for tech geniuses getting ready for a TED talk. Until they opened their mouths. Proops began the evening with jabs that were both venue specific and political. “I remember playing Madison a few years ago,” he said. “We were here during the recall,” referencing the unsuccessful bid to recall Governor Scott Walker. “Just walking past the capitol building this afternoon you could smell the fascism. This theater is probably being de-funded even as we speak.” Nice. As a troupe that hits a lot of college towns, references to local culture are usually good for easy laughs. Over the course of the evening I lost count of how many times the guys mentioned the Wisconsin trademarks of beer, brats, cheese curds, and the Brewers. In addition to the regional material, other departures from the TV version of the show included commenting on current events — yes, there were quite a few jokes about then Supreme Court Justice nominee Brett Kavanaugh and his affection for beer — and occasional “adult” material and language. Both were appreciated by the packed house, particularly in the “freeze and justify” game that intentionally puts actors in strange physical positions. And of course there’s nothing like audience interaction. Stiles was particularly funny — and ruthless — in mocking a woman in the front row of the theater who got up at the top of the show and walked out, returning about 20 minutes later. The folks who were pulled up on stage to participate in theater games with the pros were all good sports and held their own, for the most part. The guys struck comic gold when they chose Terri — a middle-aged woman wearing a Brewers jersey, she had been married three times and came to the show with her boyfriend, her son, and one of her ex’s. Lots of material there. Her bio was used in funny call backs all evening. Suggestions yelled at the stage ranged from witty to inane, and were treated as such by the performers. (Harry Potter was the only book the college town audience could think of.) Proops’s indignation about having to perform a scene in the style of Kabuki theater was earned. “Oh really?” he yelled back. “Have you actually ever seen Kabuki?” That said, he and Davis played the Japanese genre, as requested, to the hilt. The award for most astonishing improv of the evening went to Stiles and Murray, who were tasked with singing a folk song duet about being an occupational therapist — which they did, complete with beautiful harmonies. Murray also showed off some smooth dance moves and his impressive solo voice while singing a blues/reggae song on the same topic. And while nothing was scripted, there were a few “go-to” gags that the guys had clearly used before — because they worked. Hard to hold that against them. ComedySportz, Second City, and the Upright Citizens Brigade all use variations of this improv game formula, and depending on the crowd, the suggestions, and the energy/chemistry of the players, it’s usually a fun evening. But for my money, the Whose Line/Who’s Live guys are the gold standard. I’m already composing suggestions for the next time they come to town.